Paid good price, received quickly, installed easily and printed clearly on first attempt. Compatible Okidata Toner Cartridge, Magenta, High Capacity 5,000 page yield. Type C8. Replaces Okidata part number: 43324402. Color Laser Toner Cartridge compatible with Okidata C5500, C5650, C5800. 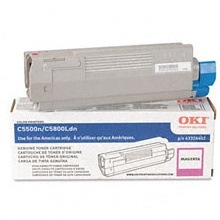 Compatible Okidata Toner Cartridge, Cyan, High Capacity 5,000 page yield. Type C8. Replaces Okidata part number: 43324403. Color Laser Toner Cartridge compatible with Okidata C5500, C5650, C5800. Compatible Okidata Toner Cartridge, Yellow, High Capacity 5,000 page yield. Type C8. Replaces Okidata part number: 43324401. Color Laser Toner Cartridge compatible with Okidata C5500, C5650, C5800.